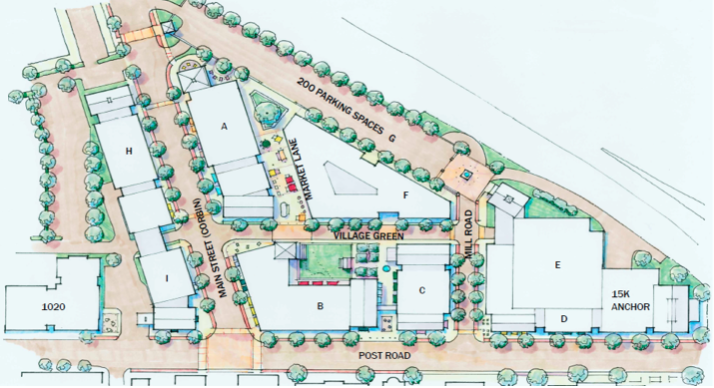 The big downtown redevelopment proposal for Corbin Drive and the Post Road, with its huge underground parking garage, some high buildings and a showcase “Village Green” park in the center of town, is being scrapped by the developer. The new proposal, being presented to the Planning and Zoning Commission on Tuesday night: Much more above-ground parking — made more discreet behind buildings and along the highway — one building near the highway that’s four stories high, and a winding, green public space that snakes into the project to take the place of the larger “Village Green” idea. The project is smaller, too, with less indoor space, and three commercial property owners on the east side of Corbin Drive have been invited to rebuild on their parcels to extend the redevelopment. Editor’s note, several additional images have been added to the article in the hour after it was first published. A table with square-feet data may be added to the article later. Even though he received approval for the from the Planning and Zoning Commission, David Genovese of Baywater Properties, the leading partner in the office-retail-residential project, decided it needed to be changed, he said in an interview. The underground parking plan proved to be even more expensive than originally estimated, coming in at about seventy-five thousand dollars per parking space with more than seven hundred parking spaces in a two-story underground garage. The retail environment looks increasingly difficult, and one high-end chain-store retailer that Genovese was courting told him that competition from the Internet took a huge bite out of sales in the last Christmas season. He talked to more retailers in the area and around the country and found that other retailers, even high-end ones, were seeing sales slip. The high-end “SoNo Collection” mall just off of Exit 14 on Interstate 95 is now under construction and will draw some unknown number of Darien shoppers to it, further eroding the retail environment, although Genovese says he doesn’t know how much or whether or not that mall will be commercially viable in the long run (malls across the country have been closing for more than a decade). Consumer demand in Darien appears to be down — with compensation lower in the financial, insurance and real estate industry sector, where many Darien paychecks originate. 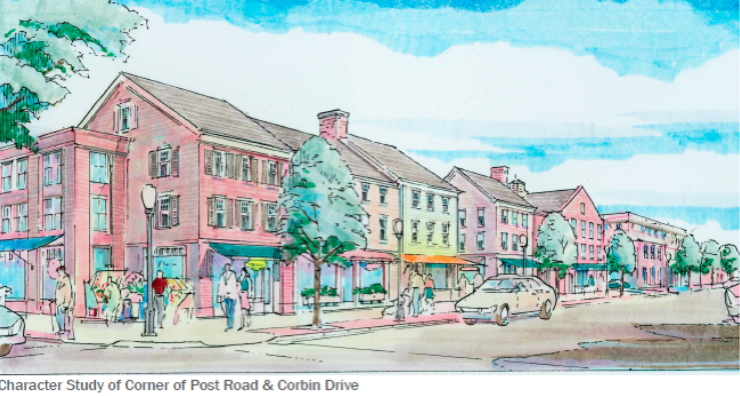 Although the P&Z Commission approved the Corbin/Post Road project, it cut back on the height of some of the buildings, a feature of the original plan that was a sore point with more than a few town residents who told the board they wanted to maintain the small-town feel of Darien and its downtown. The extra space that those buildings gave the project was going to help make the massive (and massively expensive) underground garage financially sound, Genovese said. One of the conceptual drawings in the new plan, showing what part of the project could look like. These buildings mostly have three stories and pitched roofs above them. Instead of going back to the planning board to ask for a bigger project to make the construction costs financially worthwhile, he decided to ask for a somewhat smaller project, Genovese said. This will mean that it will take longer to make back the money poured into the up-front construction costs, he said. A look down a redeveloped Corbin Drive. Baywater Corbin’s properties would be on the right, other property owners would be landlords of the buildings on the left. Aside from one four-story building set far back from the Post Road and back from Corbin Drive, the buildings would have three stories in the project, he said. Conceptual drawings of what the project would look like also include roofs above those three stories, although the overall size of the project’s buildings is down. Genovese said the project always depended on three “legs” — demand for office space, retail space and residential space. 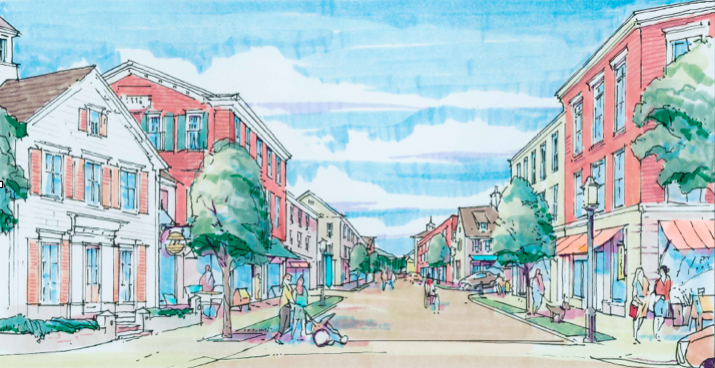 He still thinks there’s some retail demand that would fit for a location so close to highway and train transportation, and he remains certain that the demand for this kind of residential space is solid in Darien, he said. One thing lost in the change from the old proposal to the new one is the “Village Green” — a block of parkland surrounded by buildings that was meant to be evocative of a New England town green. 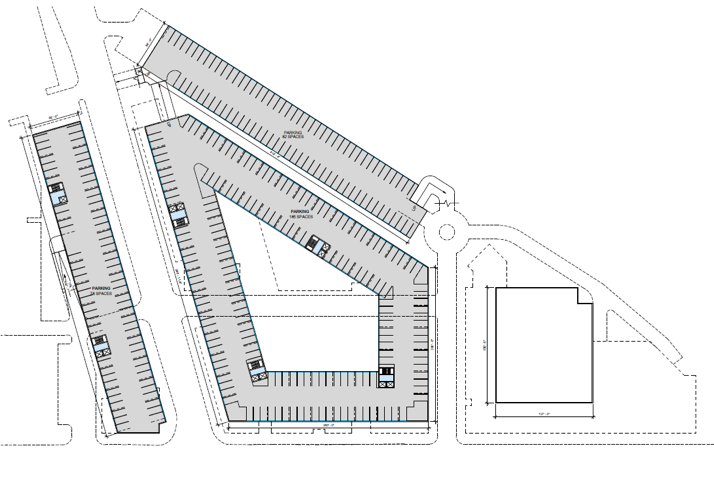 Instead of one large space, a series of smaller open spaces, some of it park-like or even smaller parks, would be connected as pedestrian spaces and wind into the development. 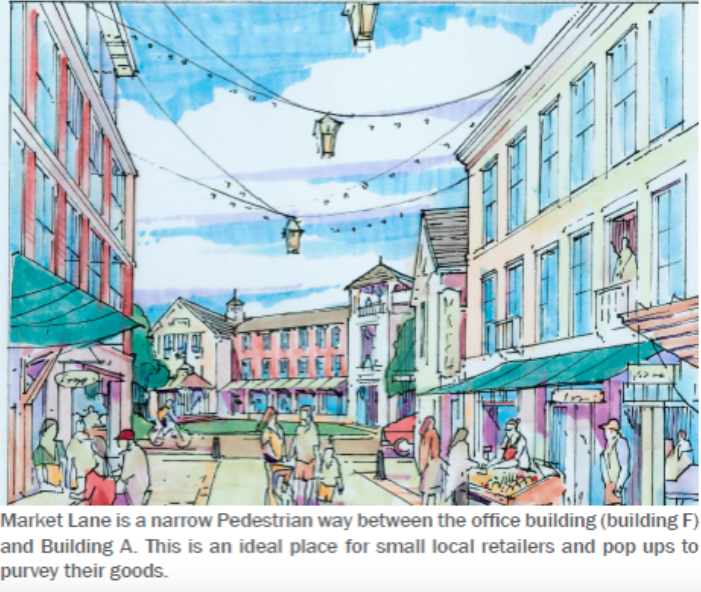 The pedestrian-parklike space, as Genovese briefly described it and as shown on a map of the new plan, would start at about the same spot near the Post Road, go in a block to a new street — part of the original proposal that remains — within the development. The pedestrian-friendly area would turn left, then turn right, even further into the development. The new plan for the project has a side benefit for the town during construction, Genovese said: It can be done in pieces. The big dig required to excavate space for a two-level, seven-hundred-parking-space underground garage across nearly the whole site would be no longer needed. 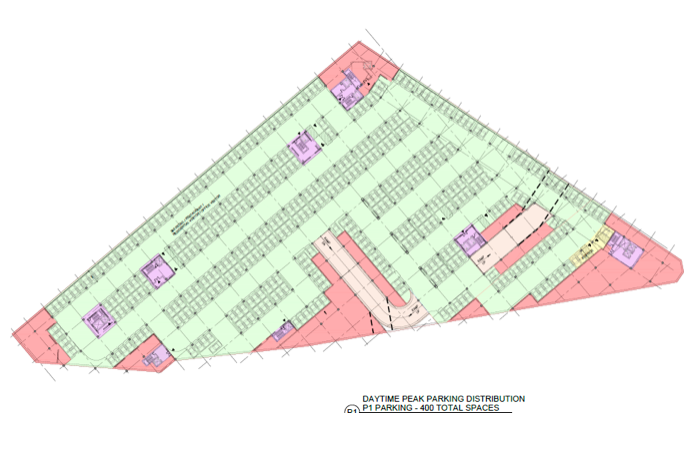 There’s still plenty of underground parking in the new plan, but much, much less of it, and on one level, not two. Parking along the highway side will be halfway beneath the surface. The previous parking plan would have covered just about the whole site, with the green areas in use and the pink/red areas essentially wasted space, Genovese said. And this would have been on two levels. The “400 total spaces” noted in the image refers to one of the two levels. There would be plenty of underground parking on one level in the central and eastern parts of the site, but the project could be built in segments: If the building where the Bank of America is now located were redeveloped first, many businesses now along the Post Road could move there as their buildings were replaced in the center of the site, for instance. That would allow businesses to keep open near where their customers are accustomed to visiting them, he said. Genovese is also working with property owners on the other side of Corbin Drive to redevelop their properties in a way that compliments the redevelopment in the triangular Corbin-Post-Interstate block. That side of Corbin Drive could have an underground garage, possibly with a bank replacing the gas station on the Corbin/Post Road corner. One of the proposals going before the Planning and Zoning Commission will be for a drive-up window for that bank, Genovese said. Genovese has also switched architects: Out is the big New York City firm of Robert A.M. Stern Architects; In is Beinfield Architecture, run by Bruce Beinfield, a prominent architect who’s firm is headquartered in Norwalk. A smaller Village Green in the new proposal.